Brian is available for jazz improvisation and jazz piano masterclasses and as a guest performer/composer. Brian’s broad experiences as a jazz pianist, composer, bandleader, and educator make him a valuable resource to students of all levels. In addition, Brian’s various ensembles, including his 20 piece big band, are available for performances and educational presentations. For younger audiences, Brian can perform well known children’s songs in a jazz style, showing how a melody can be embellished, how to feel the beat, and encourage sing-a-longs along. He will then give a introduction to some of the instruments commonly heard in jazz and their most famous masters with some brief, fun audio examples. For older audiences, Brian will talk about issues like structure, innovation and tradition, showing how the sounds and concepts of jazz have rapidly evolved over time through audio examples. 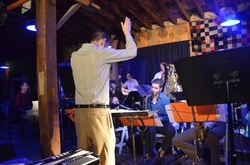 He may also discuss different musical styles within the jazz umbrella and demonstrate different ways the same melody can be approached through performance. Presentations will allow lots of time for questions and can also focus on what it means to be a living composer/artist trying to relate to jazz’s rich history.